In three western U.S. states you find three unassuming forts in desolate terrain. These three Western U.S. forts tell part of the story of western migration during the 1800s. 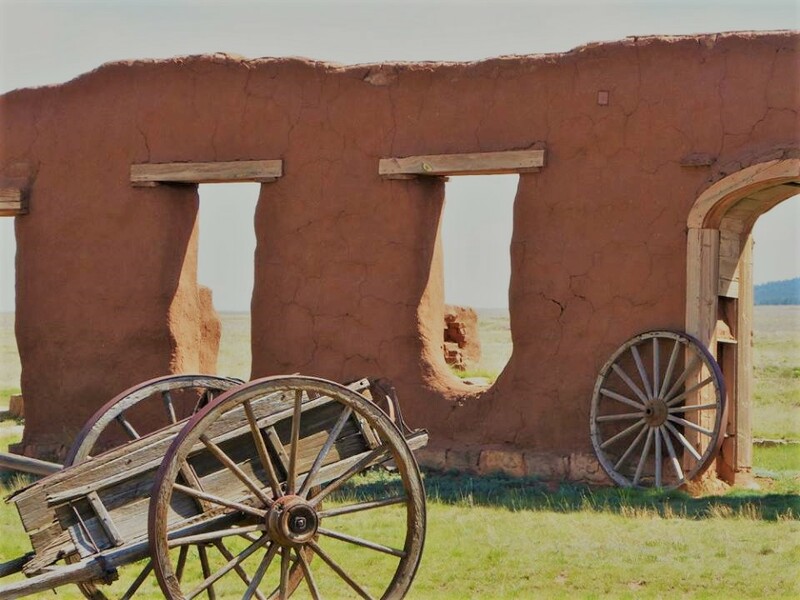 Fort Union, Fort Laramie, and Bent’s Old Fort, stand as testaments to the brave men and women who left everything they knew and drove in wagon trains along the Santa Fe Trail and Oregon Trail to uncertain futures in new lands. Over the past year, we had opportunity to visit all three forts, all part of the U.S. National Park Service. In the course of our travels, we learned the history of these military outposts and met some animals along the way. 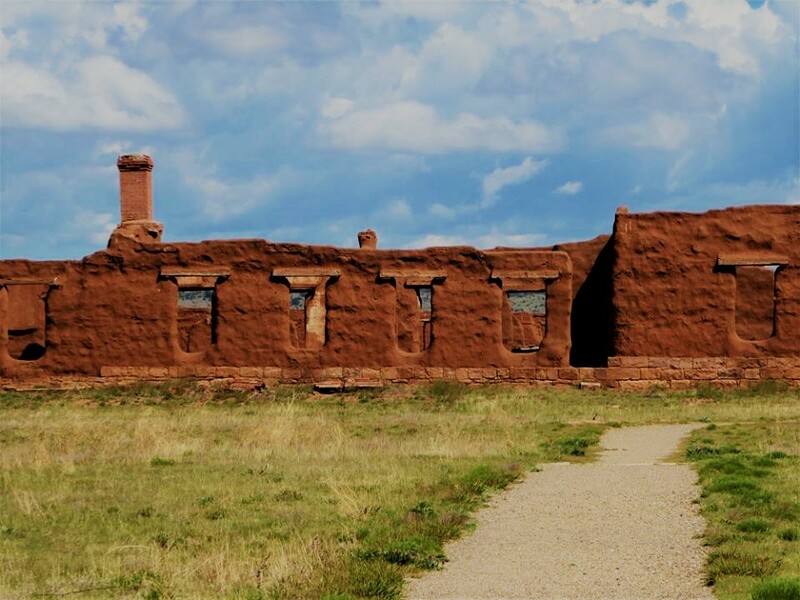 Fort Union was a southwestern military outpost for the U.S. Army from 1851-1891. Soldiers stationed at the fort were a welcomed site to American immigrants on the Santa Fe Trail. They were a source of contention for some of the Native American or Mexican residents. 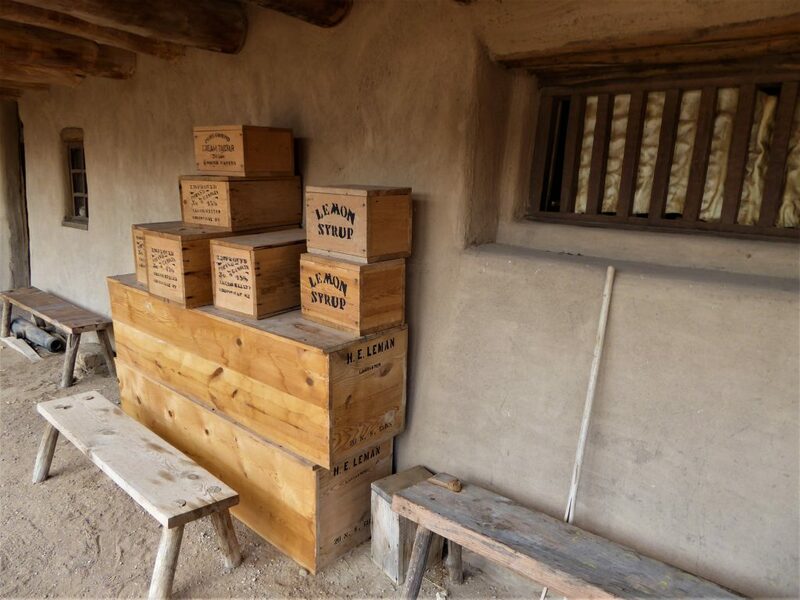 Fort Union National Monument pays tribute to this varied history by preserving the remaining adobe walls that stand near the town of Watrous, New Mexico. You see only a few of the adobe walls standing, which has a certain appeal. Many other walls have fallen over the past 150 years, and have returned to their natural state of clay and dirt. 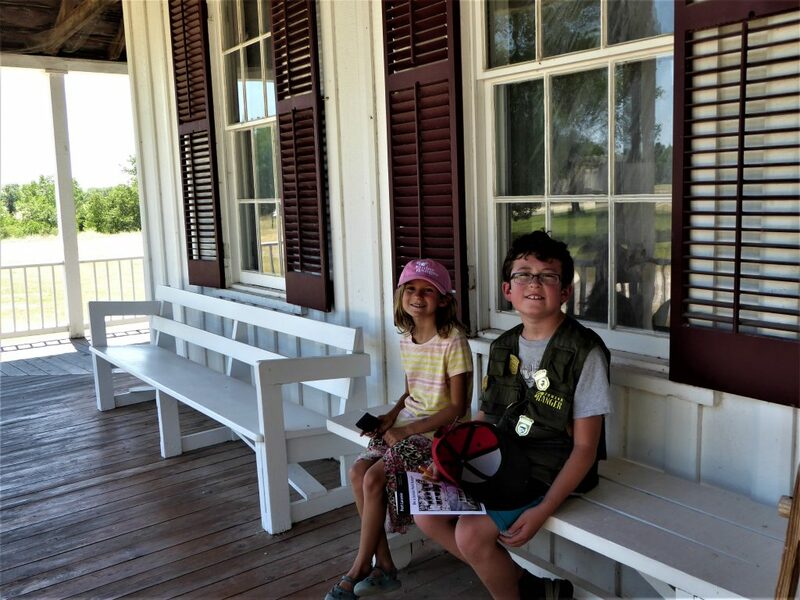 While at Fort Union, we enjoyed the Ranger-led tour of the grounds and learned about the soldiers and pioneers who stayed at the site. We saw the walls of the infirmary, set apart from the rest of the fort, where most admitted patients never left alive. We enjoyed seeing the remains of the privy and hearing the surprising story of a gun found down the toilet. Rangers conjecture that a soldiers got into trouble whiling the days away and used the privy to dispose of the gun before facing punishment. 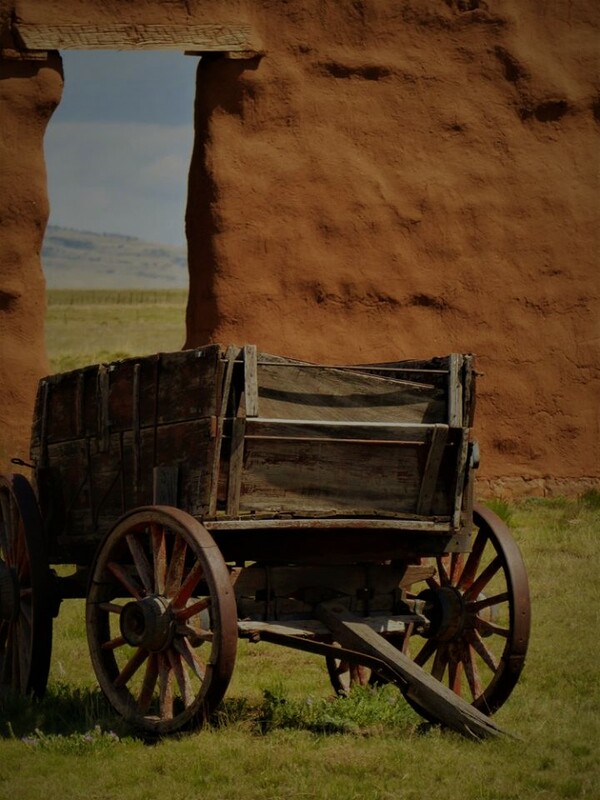 Since Fort Union was one of the stops of the Santa Fe Trail, we saw the transportation corral where Conestoga wagons lie with broken wheels, exposed to the harsh elements of a New Mexico summer heat, winter snow, and piercing, year-round wind. One hears the constant sound of a bugle playing through a loud speaker at the fort, an audible reminder of the calls to soldiers to report to drills. At the center of the fort flies the U.S. 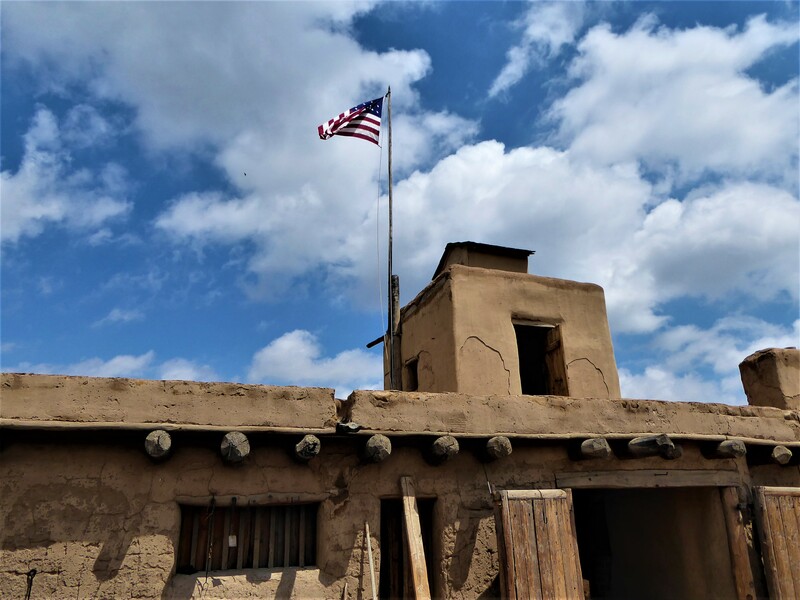 Flag, which was a sign of hope and safety for the American pioneers, but a sign of oppression for others who first called the New Mexico plains home. The walls of the transportation corral have stood up well to the New Mexico weather. Near the fort, one can see the wagon rut trail left from the western expansion of the 1800s. We were surprised to find that the ruts left deep trenches in the prairie terrain. Instead of small wagon wheel trails, thousands of wagons have left a deep indentation that looks like a dried-up river bed. It’s a 19th-Century carbon footprint, forever changing the western landscape. The walls, however, are precariously balanced in the park. Some of the thousand plus pound walls are held up by supporting beams erected by Rangers. University scientists monitor the moisture content and strength of the walls using modern electronic tools that send readings to sites hundreds of miles away. One day, the adobe walls will all fall and once again become earth. Will we remember the history of Fort Union after the walls fall? We saw animals at each fort we visited, but Fort Union provided the most unwelcome guest. 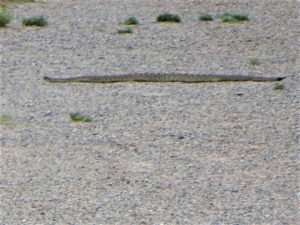 While the kids completed their Junior Ranger books, a couple warned us of a rattlesnake on the path. We walked close enough to see the prairie rattlesnake and snap a picture. The Rangers tried to remove the snake from the area without success. We were told that rattlesnakes frequent the monument. Find out more about Fort Union National Monument here. In Southeastern Wyoming, near the border of Nebraska, lies the small town of Fort Laramie. Just southwest of the town near the wagon ruts of the Oregon Trail, stands Fort Laramie National Historic Site. 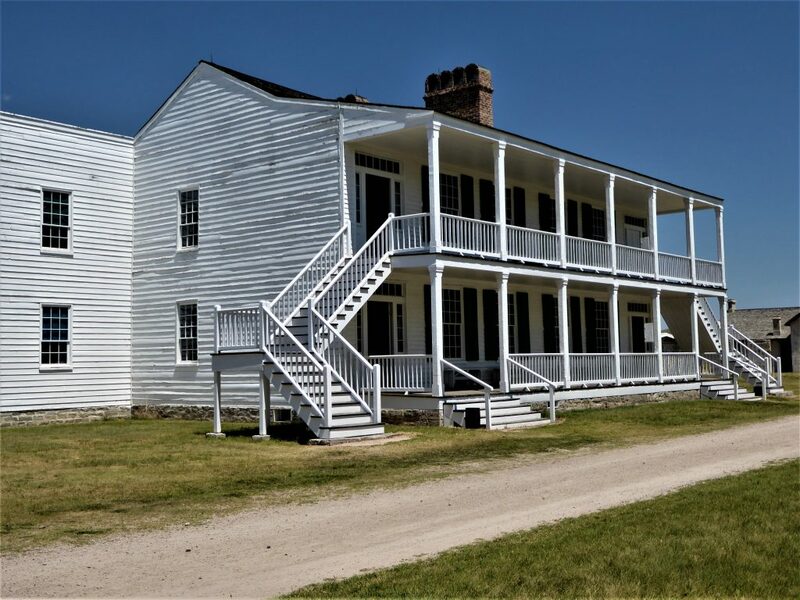 While Fort Union was the military outpost serving the southwestern regions of the United States, Fort Laramie was the outpost for the Northwest U.S. prairie. Soldier from Laramie were sent to the Dakotas and Montana in service to their country. The Fort contains a mixture of original structures, rebuilt building, and other structures that, like at Fort Union, have collapsed over time. The fort was a military garrison from the 1840s to 1890s. Meeting at the junction of the Laramie and North Platte Rivers, the fort was frequented by fur traders, trappers, miners, and Native Americans. Since many of the buildings still stand or have been rebuilt, we were better able to comprehend what a 19th Century fort looked like. We also pieced together the scope of the fort from building remains. Remains of an adobe infantry barracks at Fort Laramie. The fort had a bakery, hospital, magazine, infantry and officer quarters, and a post trader’s store. The kids enjoyed their tour of the site and completed their Junior Ranger books. They collected Junior Ranger badges for their effort. We enjoyed seeing Old Bedlam, Wyoming’s oldest standing structure, built in 1849 to house bachelor officers. The kids climbed the stairs and checked out every room, counting the number of fireplaces in the house (there was one in each room). Old Bedlam, built in 1849, is Wyoming’s oldest documented building. We also saw the Calvary barracks and got an idea of what life was like for the soldiers. They had little privacy, and spent many hours passing the time playing games like checkers, with pieces whittled out of corn cobs. While at the fort, we met up several times with this hungry visitor. 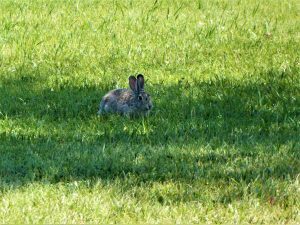 Our daughter spent a good deal of time trying to quietly approach the rabbit to get a picture. 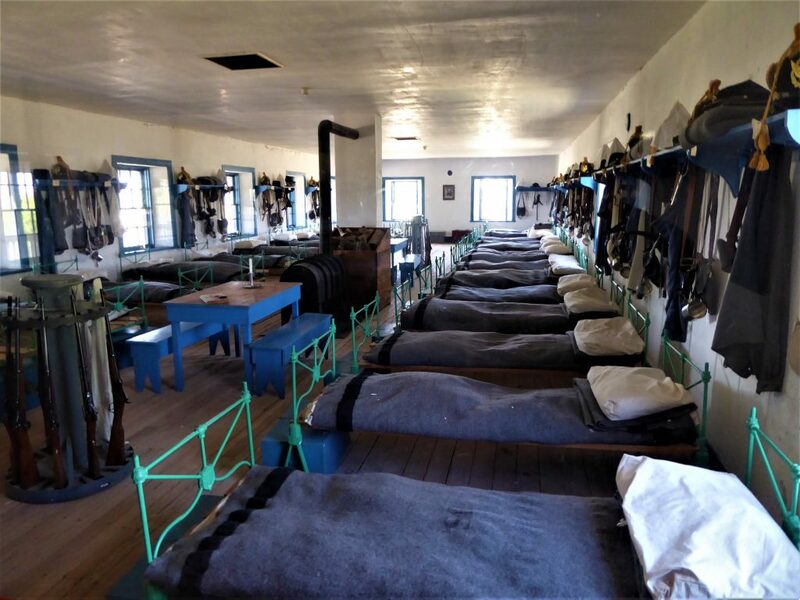 Find out more about Fort Laramie National Historic Site here. Near the small prairie town of La Junta, Colorado resting near the shore of the Arkansas River, is Bent’s Old Fort National Historic Site. 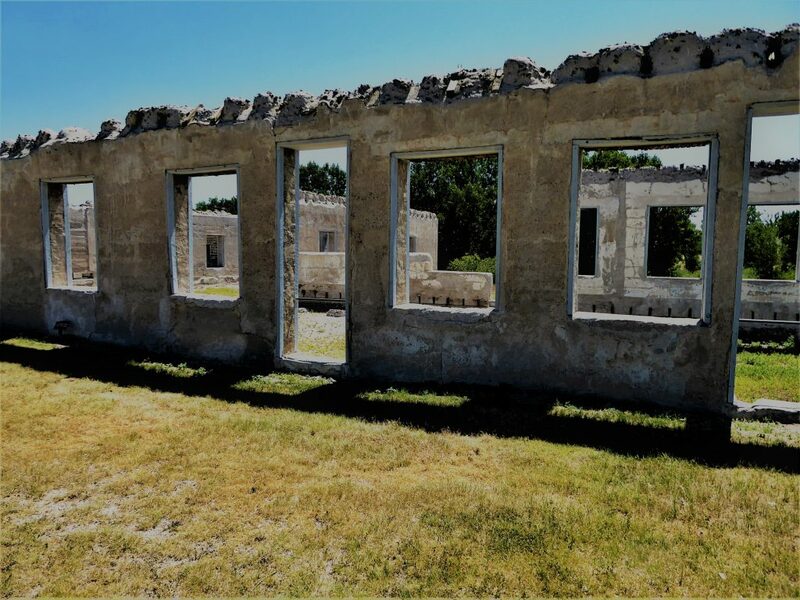 The original fort burned to the ground under mysterious circumstances (some say that the fort owner set the fort on fire to prevent U.S. troops using the trading post at as garrison during the Mexican-American war in 1849). More likely, fires helped contain a cholera epidemic in the region. 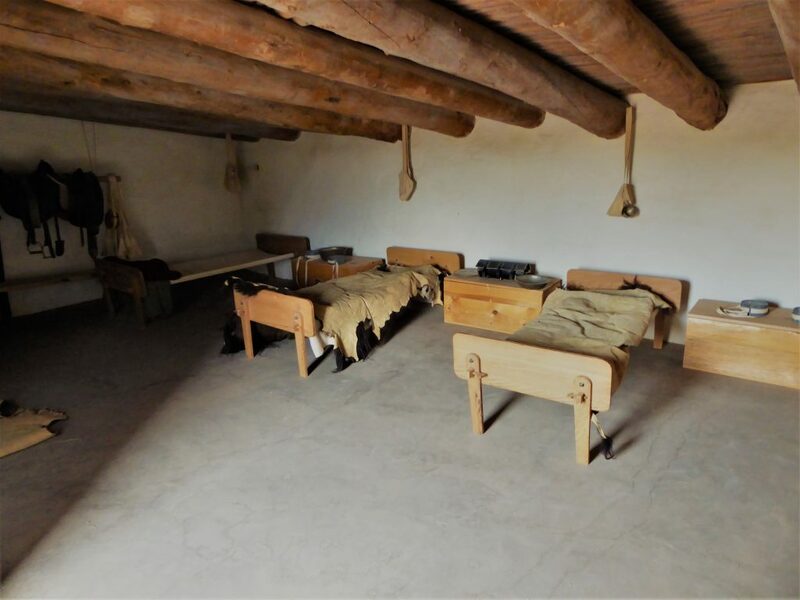 The adobe fort was rebuilt in 1976 after archaeological excavations — and a well preserved journal with blueprints and sketches — allowed builders to accurately reconstruct the fort. 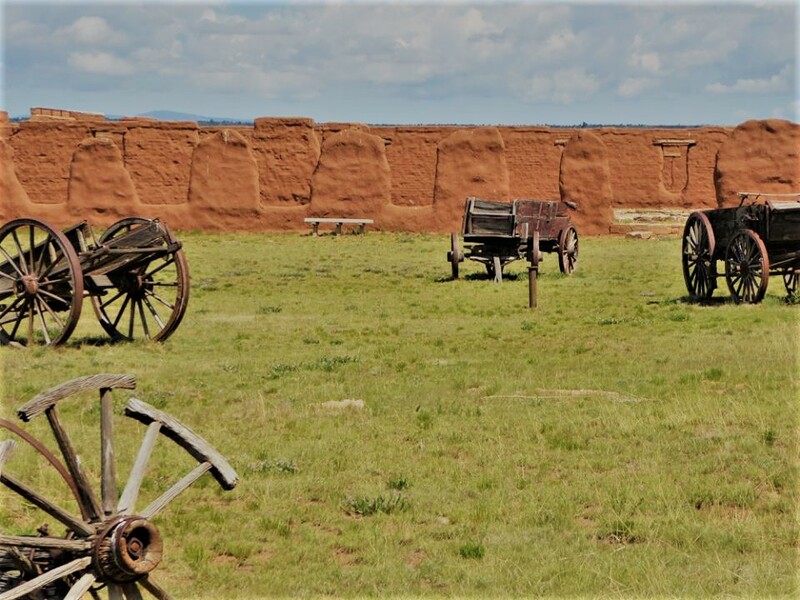 Unlike Forts Union and Laramie, Bent’s Old Fort was a trading post on the Santa Fe Trail. 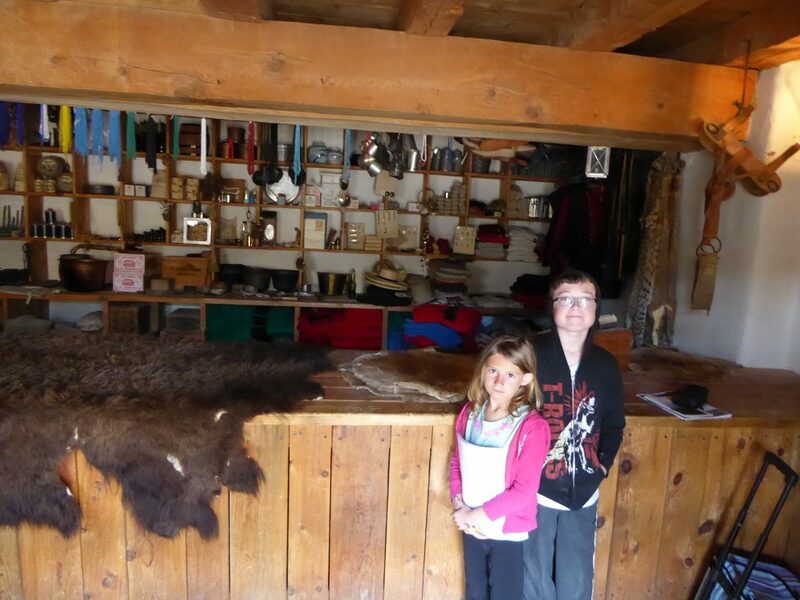 Here fur traders sold their pelts. This was also the location where Native American, Mexican, American, French and other cultures mixed and mingled in the interest of trade and commerce. 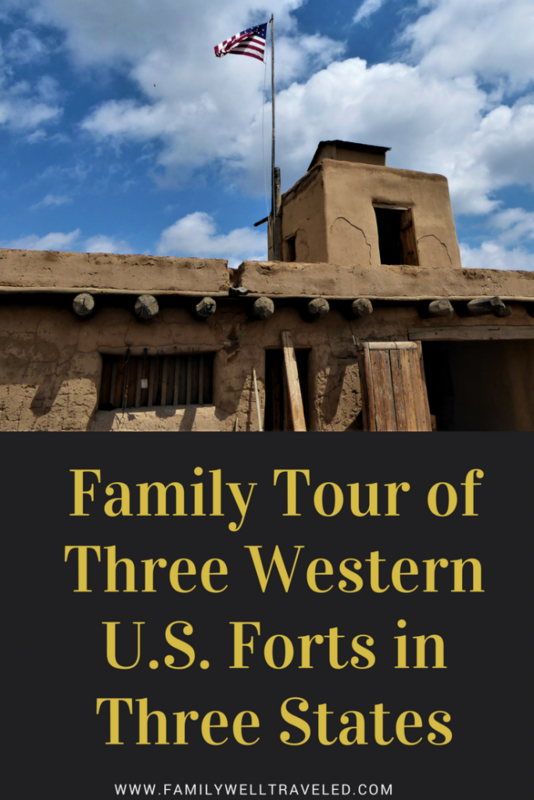 While the fort was used by U.S. military during the Mexican-American War, it was originally built by brothers William and Charles Bent and Ceran St. Vrain as a commercial trading post. The fort, which was for a time the largest structure between St Louis and the Pacific Ocean, became a central spot for peaceful trading. U.S. troops moved into the region during the Mexican-American war, disrupting trade. The remote southwestern fort also provided temporary housing for those passing through. It was sort of like a modern day hotel or extended stay for the traders, soldiers, and immigrants. Today, Bent’s is as a working fort. Animals are onsite. Chopped firewood heats the adobe fort. Rangers dress in period costume and ply their trade. We met with a Ranger who served as Blacksmith at the fort. We talked with him and learned how a blacksmith at the fort held on to every scrap piece of metal to use at a later time. A blacksmith working the fire and bellows at Bent’s Old Fort. 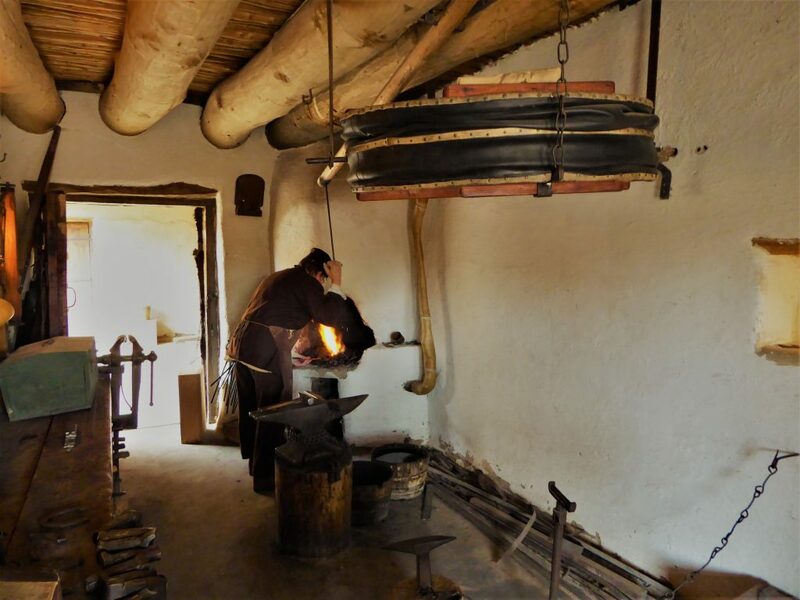 The National Historic Site takes pride in yearly Santa Fe Trail weekend encampments, a fourth of July extravaganza, and Old West Christmas celebrations. We had read about the cats at Bent’s Old Fort before we arrived. They are the resident pets and make themselves at home. While watching a short film about the history of the fort, one of the cats jumped up on the chair next to me, startling my kids. The cat curled up next to me and enjoyed by body heat while we watched the film on a cold April morning. They also keep the rodent population in check. 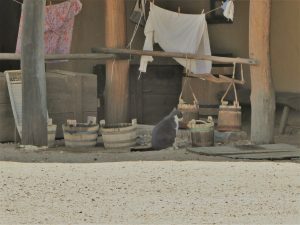 One of the resident pet cats at Bent’s Old Fort. We also saw a peacock, chickens, and steers during our visit. 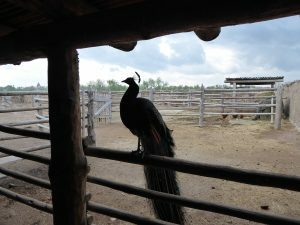 We found this peacock perched at the corrals. 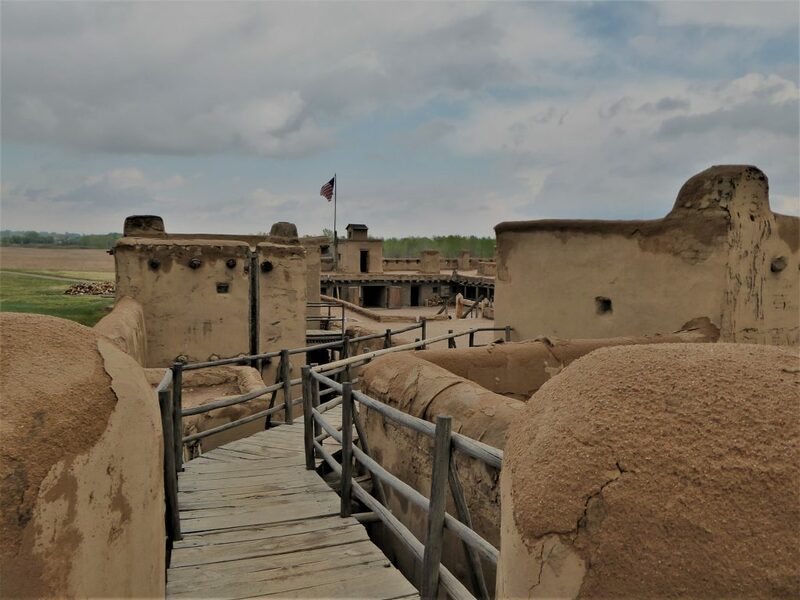 Find out more about Bent’s Old Fort National Historic Site here. Have you visited these or other U.S. Forts? We would love for you to leave a comment and tell us about your experiences. Read About our trip to Santa Fe, New Mexico here. Here are some other National Parks sites in the western U.S. here. This is such a cool idea!The view from Bent’s Old Fort has such a Western vibe- love it. I would love to include something like this in a US tour! Our daughter really liked Bent’s Old Fort. I have only been to the USA twice in my life (third time next month) and still not yet visited a fort. I would totally love to check these places out and get a grasp on the history behind them (and of the country as well). Hope you get a chance to visit one some day. And enjoy your travels in the U.S. next month. Oh I like your post very much. It’s a new idea for me to visit forts in the west of US. It looks very authentic. They are authentic, and we really liked how each site works so hard to preserve the authenticity of the fort as it would have appeared during the 1800s. Interesting that you got to see all three of these, it helps piece together history a little better I think. I think I would like Bent’s the most since it has cats and other animals. Thanks for sharing! All three had something special to offer, so we feel privileged to have visited all three. While the history of the US is so short compared to other parts of the world, it is still interesting to check out. I’d love to go on a road trip and male pit stops at these forts and places like it. Looks like a fun outing for the kids as well. Fortunately, all three are off of I-25, a major interstate that goes through all three states. So it makes for a good road trip (with some additional pit stops, too). Our family loves touring forts throughout the United States. Each one tells a unique story! We have visited several forts and battlefields in the Midwest, the South, and New England areas. I would love to tour a few out West someday! We’d love to visit some of those forts in the areas you have visited. All the three fort structures and their interiors are very interesting. Old Bedlam, Wyoming, doesn’t look like it was built way back in 1849 ..remarkably well preserved for that kind of building material. Rattlesnake too, yikes! I’ll bet the kids really loved exploring the forts. 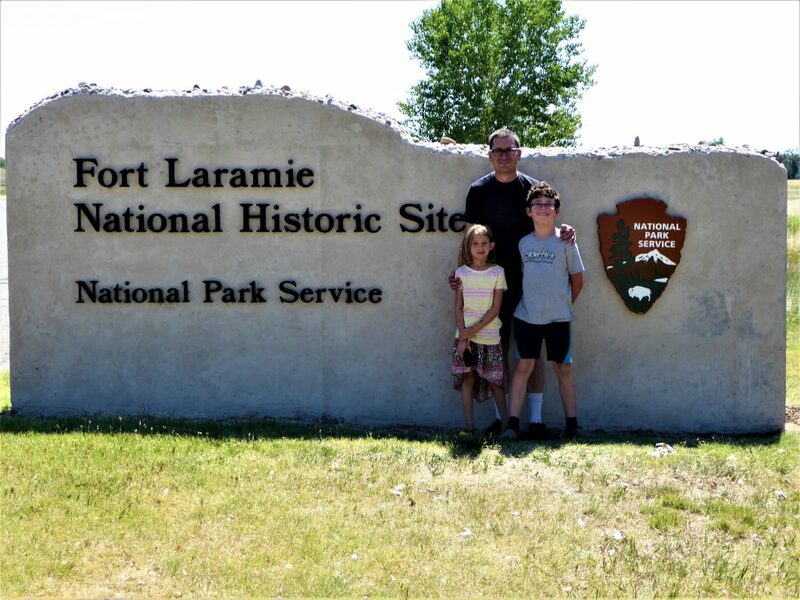 I remember going to Fort Laramie as a kid and really having a great time. I loved watching westerns on tv, so that helped. I now want to go visit them again. I so love visiting historic forts when I travel as it is such a great way to learn about history. I haven’t been to these and would love to check them out. Thanks for the tip! You are very welcome. We love learning about history too. Great post, love reading something a little different like this and photos are really cool too! All of these forts have such interesting interesting history. So these forts are protected and maintained by the National Parks Services? Yes, they are all maintained by the National Park Service. I am so disappointed that I am not just reading this! I have been to Colorado and Wyoming and never visited these forts! I love history and would love this! Hope you get the opportunity to visit them one day. I am a history buff too. Our kids seem to enjoy learning about history, so we take every opportunity to through a little bit of history into our travels. Very interesting! One can only imagine how Natives of the area felt about this and I’m glad that you mentioned it several times. Snakes are a phobia of mine *shudder* but it was a very lovely read about a part of America’s history. Only Fort I’ve been to is the one on Governor’s Island in the NY harbour. We need to get to the Governor’s Island fort. Last time I was in New York, we went to Liberty and Ellis Islands. My sister loves Governor’s Island. I still shudder when I think about that rattlesnake. I am not a fan of snakes at all.